This very beautiful Roadster has been mildly outlawed by it\' s current owner, who owned the car since 1995. The tub was taken down to bare metal and finished in correct Porsche black. The gaps and shut lines on the body are excellent. The interior was completely redone in red leather. Original Speedster seats were used as well as a Nardi steering wheel. All gauges rebuilt. The original Super 90 Porsche engine was improved by Vic Skirmants with oversized Shasta pistons and cylinders, a mild cam and ported heads. The transmission has a 4th gear for highway cruises. The car also carries 356C disc brakes all around and Fuchs rims. This car was build to be driven and enjoyed and not as a trailer queen. 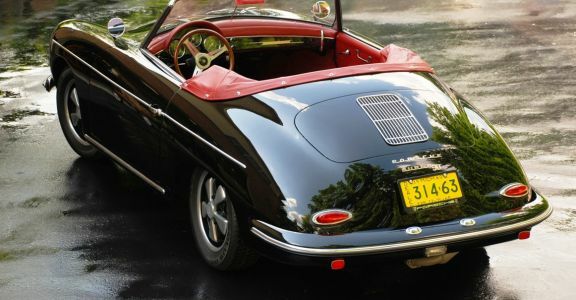 It is technically and cosmetically in stunning condition and presents itself in perhaps the most sought after color combinations in the 356 world. Please make sure to check out all the photos to understand the craftsmanship that went into this B Roadster.